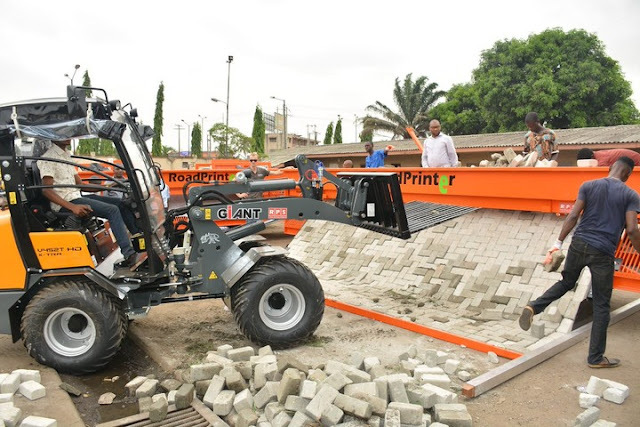 The Lagos State Government through the Lagos State Public Works/Drainages has acquired three Road Printer Paving Stone Laying Machines to enhance road construction and maintenance across the State. The former method of laying the bricks are done manually where a brick paver on their hands and knees can produce between 75 and 100 square meters of brick pavers per day. Its really time-consuming and your back can really hurt after 8 hours of work like that. Now, this has been made simpler and faster as this machine can lay a 100 square meters in few minutes. See more pictures below..